Paramount is the Clay Hill community that centers around the life of Elias Hill, a formerly enslaved man who led the migration of freed slaves from York County to Liberia, Africa, in 1871. Hill and his followers were victimized by the Klan during the Reconstruction Era, and before he left, he testified before a Congressional committee on the atrocities they had suffered. An on-site state marker at Allison Creek Presbyterian Church (c.1854) commemorates Elias Hill and the Liberian migration. It is the only historic marker in the state that mentions the Klan. 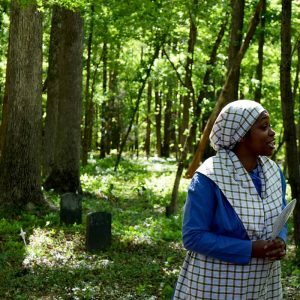 In the woods nearby is a historical graveyard that contains remains from former African American slaves and free people. The graveyard has been restored with markers and walking paths. The church is home to the annual “Let the Land Say Amen” festival. Guided tours of the church and its historic cemetery, as well as a short film on the history of the church and its connection to Liberia, are available.